You have to have some sympathy for the LG G7 ThinQ. Going up against the Samsung Galaxy S9 and iPhone X is like turning up to a paintball day and realising the other team has real guns. It has some interesting tactics to give itself a chance, though. And you know what? Most of them work pretty well. The LG G7 ThinQ has the audiophile-friendly quad-DAC seen in some previous LGs like the V30+. And while its back-rumbling BoomBox speaker feature seems a total gimmick, it’s almost bizarrely good. 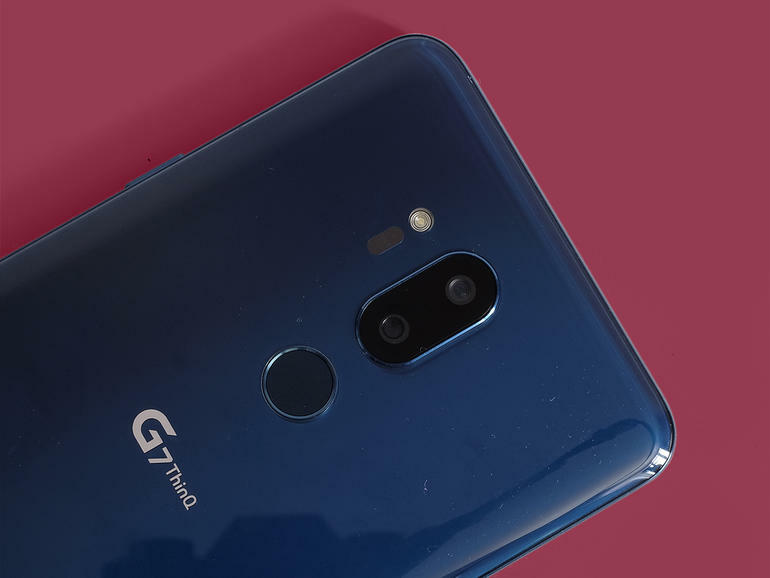 Add the wide-angle camera and a supernova 1000-nit screen and the LG G7 ThinQ starts to sound interesting. It doesn’t flatten the competition but, OnePlus 6 aside, offers better value than many top-end phones. Who knew it’d be so easy to get bored of glass and metal phones with amazing build quality? 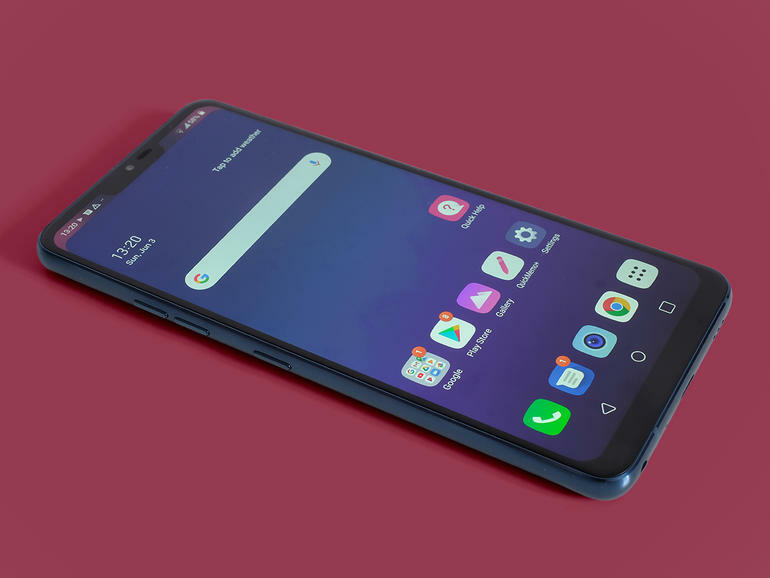 The LG G7 ThinQ is about the 347th phone this year to have such a design. Smoothly curved Gorilla Glass on the back slips almost seamlessly into aluminium, curving again into glass on the front. It’s comfortable – an expensive glass and metal pebble. Our blue version looks a little like the Honor 10, but larger and a little more laid-back. If the Honor 10 is Sunny Delight, this is orange juice. In a dim room it almost looks black, turning bright blue when it catches the light. It’s a very friendly size too, smaller than the HTC U12+ and OnePlus 6. In fact, friendly is the impression it leaves all-round, though, not “super-luxurious and expensive”. Perhaps too smooth and cuddly for its own good, it doesn’t telegraph the high-end materials used as much as the Nokia 8 Sirocco. There are other sides to the hardware, though. 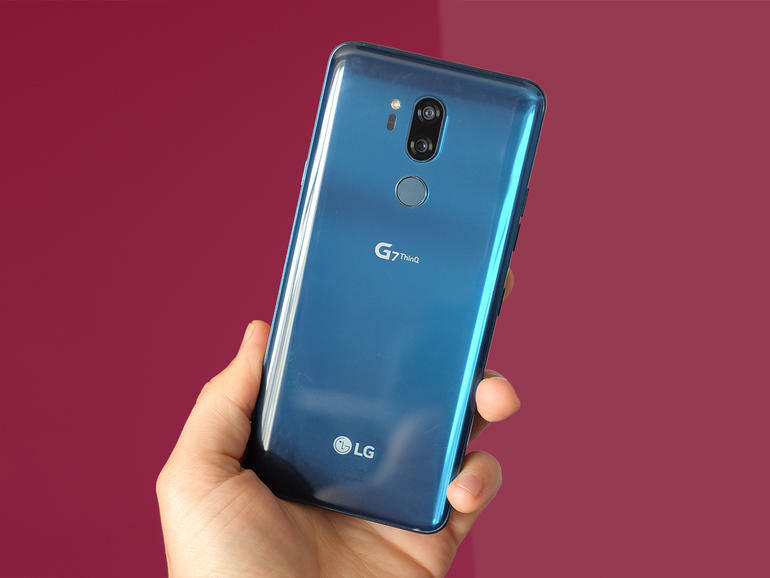 The LG G7 ThinQ is water resistant to IP68, so it can take being dropped in water. There’s also a dedicated button on the left side that calls up the Google Assistant, so you don’t have to say the “Ok, Google” wake word anymore. Anyone who owns a Google Home knows how quickly that gets old. BoomBox is perhaps the most interesting hardware extra. I initially though this was a terrible idea: the back vibrates to resonate sound through the surface on which it sits. However, it actually works. Place the LG G7 on a surface happy to resonate and it dramatically increases the speaker’s soundstage and bass. There is almost no surface that won’t improve the audio quality. However, having tried every table-top, box and shelf available, the best are those with a hard-ish surface and a softer core. A cheapo IKEA Linnamon desk, made of wood laminate with a bargain basement paper core, makes the LG G7 ThinQ sound like a not-that-bad Bluetooth speaker, outdoing many laptop speakers. On its own the speaker doesn’t get close to matching the Galaxy S9 or iPhone 8, both of which have better bass and tone, but with BoomBox involved the G7 is something special. The screen is a little unusual too. This is a sharp 6.1-inch, 3120 x 1440, 19:9 display with an LCD panel, rather than an OLED. However, it’s extremely bright, reaching almost 1000 nits using a boost mode. This makes it clear in the brightest sunshine. Colour doesn’t initially look quite as good as the Galaxy S9’s, but you can alter the display character with six different personalities, from super-saturated to “cinema”. They aren’t as effective as Samsung’s, but the customisation is welcome, and the ability to separately alter colour temperature is a big plus. It’s a solid screen, and a great one among LCDs. But it’s actually the window dressing that makes the LG G7 ThinQ stand out. Many phones have a notch. Some let you hide it. But LG lets you dress it up in different clothes. LG calls this “Second Screen”. 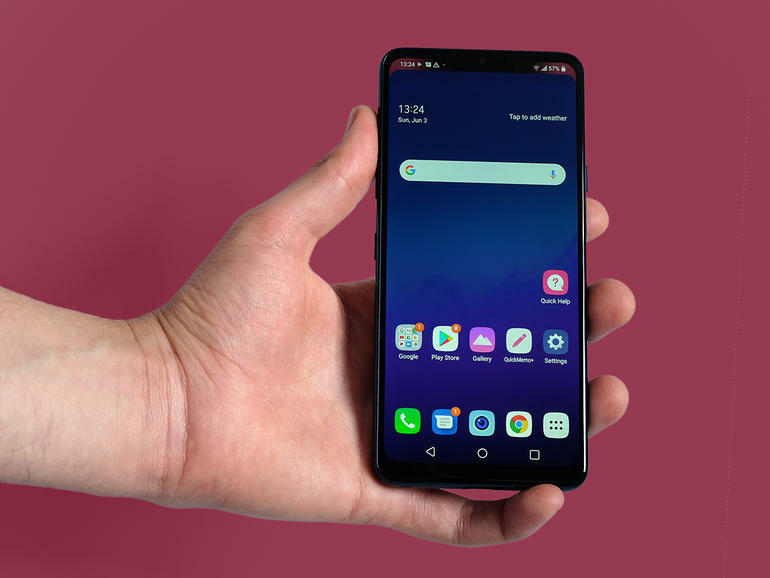 The LG G7 ThinQ’s notch can be replaced with a red or grey-to-black gradient or a rainbow one, and its edges can either be squared off, or tapered in to match the actual display contours. Want a notch? It’s there. Don’t want one? Let’s drape some colour there instead. The notch area is still used for notification icons, so the space is not wasted. Are notches here to stay? The only reason fo them to exist other than iPhone-copying is to house a front camera and any front-facing sensors. However, the LG G7 handles the problem more creatively just about anyone else. Core software is a different issue, though. 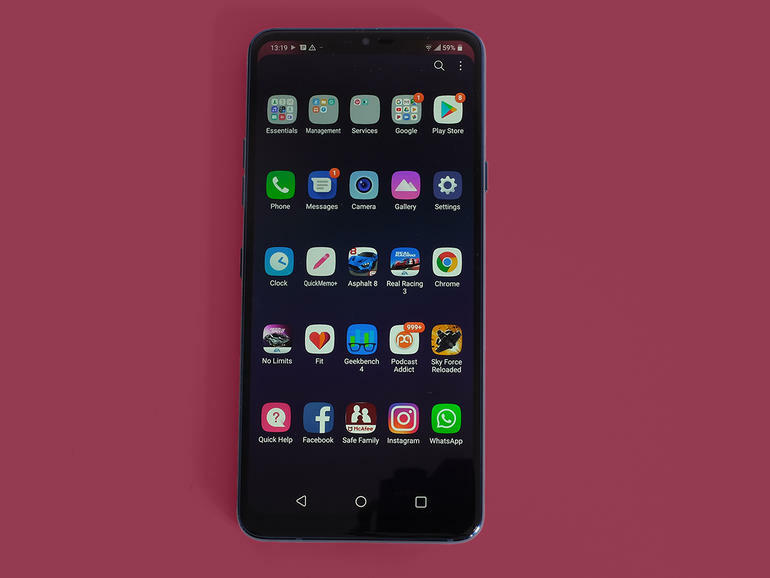 The LG G7 ThinQ runs Android 8.0.0 and LG’s own interface. Critics may rag on Huawei’s software, but LG’s current version takes you even further away from the feel of default Android. Fresh out of the box, the LG G7 ThinQ behaves more like an iPhone than an Android. There’s no apps menu. You just have homescreens. 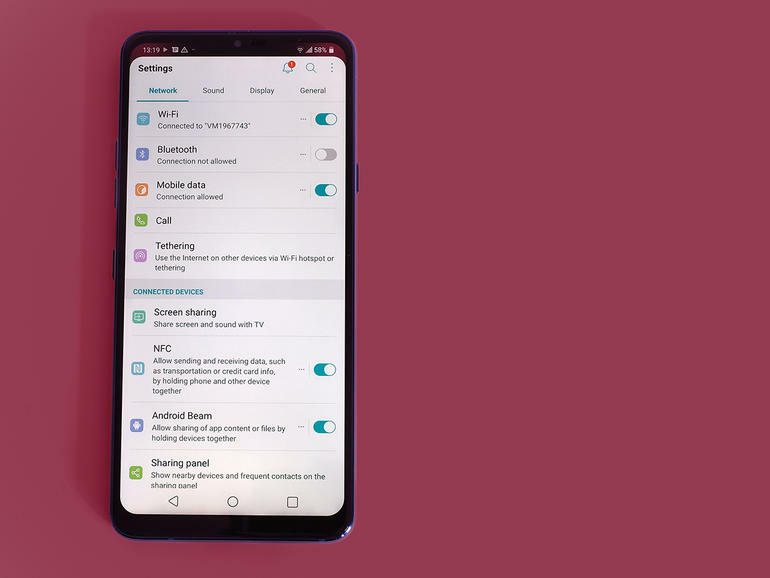 Dig deep enough into the Settings menu and you can add an apps menu, but it’s arranged in pages rather than a vertical scroll like that of a Pixel 2 or Galaxy S9. You have to accept the LG Android way. However, it’s not that hard to get on with. The LG G7 ThinQ runs well, and feels fast. However, it does not have the most stylish look around. It looks a bit “nothing” until you put your own touches on it. But as long as you’re wiling to do so, you can inject the G7 with a bit more personality. It’d also be very bad news for LG if the G7 felt anything but super-quick. A Snapdragon 845 runs the show. And, as of June 2018 this is the fastest CPU you’ll find in an Android phone. Eight Kyro cores and an Adreno 630 CPU make this phone ready for anything. It breezes through high-end games and scores 8990 in Geekbench 4. That’s a mammoth score. And the LG G7 is also one of the more affordable phones this powerful. It’s far cheaper than a Galaxy S9, around £100 less than the HTC U12+. The OnePlus 6 still has the edge for value, though, at £469. Camera quality often separates the good from the great, and here you get a mixed bag. The LG G7 ThinQ has dual rear sensors, both with 16 megapixels. This second camera has a true wide-angle lens. It’s not just a digital effect, and it lets you fit more people, or more landscape, into an image. This isn’t a true GoPro view, it doesn’t seem to bend reality around the lens, known as the “fisheye” effect. But it does let you fit much more into a shot. Like the rumbly speaker, this is something different. Most high-end phones have lenses that zoom in. This one zooms out. The LG G7 also has an AI mode. This scans through what the camera sees in real time, looking for objects and scene types. At one point it mistook a park bench for “ham” and seems to come up with some truly odd tags constantly, which – rather distractingly – appear on the display as you shoot. Thankfully, not all of these are actually recorded. In the LG G7 gallery app you’ll see a section called “tags”, which analyses all your photos, not just the camera ones. There are loads: field, dog, couple, bridge, and many more. And thankfully, no ham. That one didn’t make the final cut. Using the AI mode also applies colour filters that jack up the colour. Non-AI photos usually look better, more realistic. You can’t get around the main LG G7 camera issue by turning off AI, though. The phone has a very bad habit of blowing-out highlights. On every sunny day you’ll see great big blocks of white in clouds, caused by overexposure. This is because the G7 is obsessed with making its images look bright and punchy, and they usually do. But blown highlights always look bad. A lot of phones around the price handle this better, including the HTC U12+, OnePlus 6 and Google Pixel 2 XL. The Sony IMX351 sensors used here have lower native dynamic range than the 12-megapixel ones of many top end phones. That won’t help. The camera feels fairly fast-to-shoot as long as you don’t use the AI mode, which slows everything down a bit. However, on occasion the shutter button just doesn’t seem to react to presses either. It could do with an update or two. I’d still class the LG G7 camera experience as pretty great, though. This is where the screen’s 1000-nit brightness excels. Even on the brightest day you can see clearly what you’re shooting. It has special skills for night shooting too. An optically stabilised rear camera makes taking sharp, pretty detailed night shots a cinch. And when there’s virtually no light at all, you can use the Super Bright mode. A little button to turn this on appears when it’s dead dark out. This reduces the resolution to four megapixels and the results never look very detailed. However, it’s brilliant for taking photos that would otherwise look like a sheet of black paper. For video you can shoot at up to 4K resolution, and as there’s OIS, you get stabilisation even at 4K. Footage will look smoother at 1080p, though, as this uses software stabilisation. It crops into the image, using the edges of the frame as a buffer. Around the front you get an 8-megapixel camera. AI crops up here too. It recognises how many people are in the scene and lets you blur out the background for a DSLR-like look. This isn’t the best selfie camera round, but it is better than the 5MP one of the LG G6. The LG G7 ThinQ has one of the smaller batteries among top-end phones. It’s a 3000mAh unit, about as low capacity a phone of this size can use before you start wondering if its designers have started drinking at lunch time. However, its stamina is, surprisingly enough, perfectly decent. Every day I use the LG G7 I seem to end up with around 30% charge left when I set it to charge overnight. This isn’t a two-day phone. But given it has a 3000mAh cell, things could be a lot worse. The LG G7 comes with a fast charger, getting you up to 50% in 30 minutes. It supports wireless charging too, if you’re just too lazy to plug in a cable. The LG G7 ThinQ is one of the best ways to get a top-end phone that doesn’t cost so much it’ll make your bank account crumble to dust. And while from a distance its unique extras sound like gimmicks, they’re actually neat. Wide-angle camera? Great for holidays and big group photos. BoomBox rumble speaker? It actually works. 1000-nit screen? A killer extra for taking photos on sunny days. The camera isn’t close to the best thanks to its tendency to overexpose 24/7 and the new AI stuff is a bit rubbish. But when the Galaxy S9 is £140 more, the LG G7 looks like a good deal. 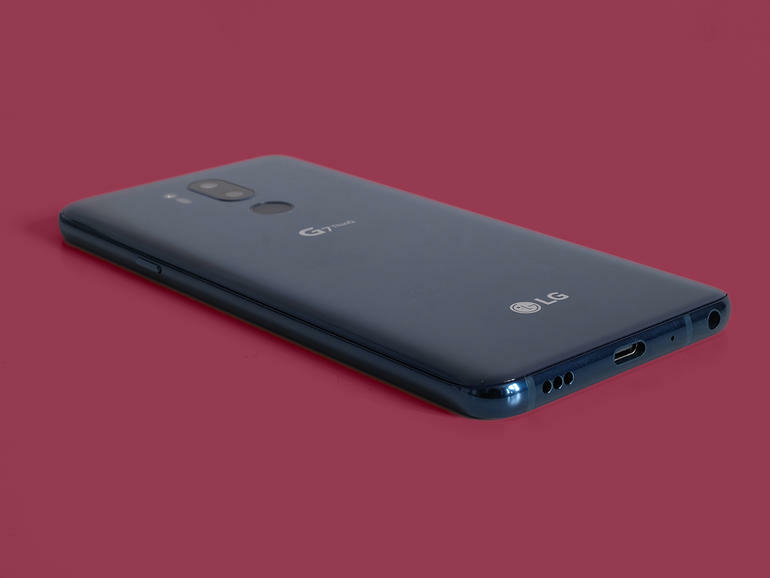 You get an even better deal with the OnePlus 6, of course, but it doesn’t have the quirky extras that make the LG G7 different.